Premium quality photo jigsaws made from wood! APuzzlesPrint offers you a way to take your favorite photos, and have them turned in to a high quality wooden jigsaw puzzle! Not only can you use your own choice of picture, we also allow you to add a personalized text message as well. Wooden jigsaw puzzles make exceptional gifts for important events such as weddings and birthdays, or even as Christmas presents for your family. Just choose the photo you want us to turn in to a jigsaw, maybe a picture from a family vacation, a relation’s birthday party or a friend’s wedding. Even amusing selfies or other funny pictures make a great choice. It’s easy to order a wooden photo puzzle. Just select the size you want, then upload your chosen photo! A wooden jigsaw puzzle makes a fantastic gift! Our wooden photo puzzles are a fairly new addition to our product lineup. A wooden picture puzzle is much stronger and more hard wearing than a cardboard puzzle. It is also much more pleasurable to pick up and handle. This adds to the pleasure of solving the puzzle. We offer wooden photo picture puzzles in two sizes, and in six different piece counts. So we certainly will be able to make a wooden puzzle that fits what you need exactly. A wooden picture puzzle is a quality product! PuzzlesPrint makes three separate types of special wooden puzzles available. We have three special messages you can choose from. I Love You, Happy New Year and Merry Christmas. Each of the letters of the message is a spate piece of the puzzle, which are surrounded by normal puzzle pieces. Our wooden photo puzzles make a very unique gift. When you give one to your friends or family members, it is guaranteed to be well received and cherished. Premium quality wooden photo puzzles with beautiful presentation! We make each wooden picture puzzle from 4mm tick plywood. Each one is delivered in visually pleasing packaging, with the original artwork printed on the lid of the box. 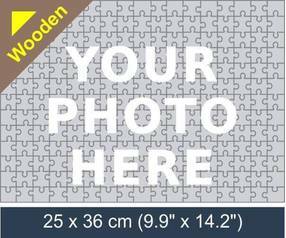 Ordering a personalized wooden photo puzzle from PuzzlesPrint Is very easy to do. All that it takes, is a few minutes. Select the size of the puzzle you wish us to make, and then choose the number of pieces you prefer. Finally, upload your choice of photo, and then decide how many you would like to order. Finally, add the puzzle to your shopping cart.